Only 800 metres from the splendid coves of gilded sand of Porto Cesareo lies the Villa Hermosa, a 4-star resort offering the magical atmosphere of an ancient Mediterranean residence. The sobriety and elegance of the furnishing, the frame of the external spaces is co-ordinated in an oasis of quiet, an angle contained between sky and sea in the blue heart of the Ionic coast of Salentina. 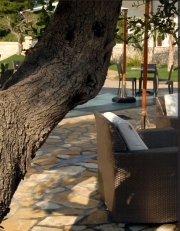 Completely absorbed in in an uncontaminated landscape among the sour perfumes of nature, of the secular olive trees and of the wild flowers, this safe haven for visitors is just perfect for welcoming and to surprise the most refined guests with an inimitable mix of comfort and peace. 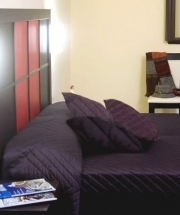 Villa Hermosa features 51 standard rooms and 1 suite. The design is elegant and refined. The precious finishes and comfort combine for unique beauty. You can reach “Salento” by airplane making a stop over Brindisi airport. Here you can choose to wait for the bus that links up the airport to the centre of Lecce or to rent a car. 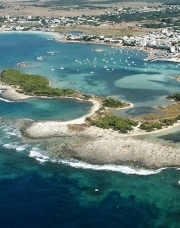 After the arrival in Lecce, you can go on to Porto Cesareo using the buses of the FSE. 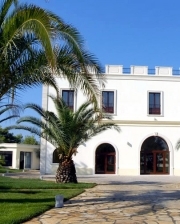 Once arrived to Porto Cesareo, you can contact the reception so you will be reached and accompanied at the structure. Arriving from North, you drive through the highway A14 up to Bari. From here,you go on toward South along the speedway Bari-Brindisi-Lecce. Once reached Lecce, you take the West bypass road, going out to the release Monteroni-Arnesano, for then to go on in direction Leverano-Porto Cesareo. Before entering to Porto Cesareo, you follow the release for Nardò. Then you will be lead on the SS 174, where after 600 meters, you will find, on your right, Street Bainsizza. By train “Salento” can be reached through the adriatic line (Milan-Bologna-Pescara) or through Rome-Caserta. Once arrived to Lecce station,it is possible to use the buses of the FSE that will bring you up to Porto Cesareo. Once you are in Porto Cesareo, you can contact the reception, so you will be reached and accompanied at the hotel.